The most hellacious, stupid, awe-inspiring, chaotic traffic I have ever seen in my life. Before we made it a couple blocks, I concluded that Boston had beaten NOVA/DC as the place I like driving the least. Pedestrians in huge clumps blatantly disregarded signals and crosswalks; traffic crawled; the roads narrow and poorly signed. My tablet’s GPS momentarily gave up. I missed a turn and it took me half an hour to go around a relatively normal-sized block. Dan texted me about the traffic at one point. The day before, he suggested staying in his town, which is an hour train ride away from Boston. I wondered why. This was why. When we got to the garage, I was so flustered, I rammed Nicole into a concrete wall. Luckily, nothing was damaged despite the outstanding thud when my front license plate made impact. I swore that I did not want to be in my car again until we were leaving Monday. That’s how you know how bad it was to get around by car. Initially, we had plenty of time to spare before we were to prepare for dinner with Dan and his wife. We were in our room for about 20 minutes before they arrived. On the bright side, it gave Dan and me some time to catch up. It was amazing that, after 15 years, I immediately recognized him. We definitely can’t go this long without seeing each other again. 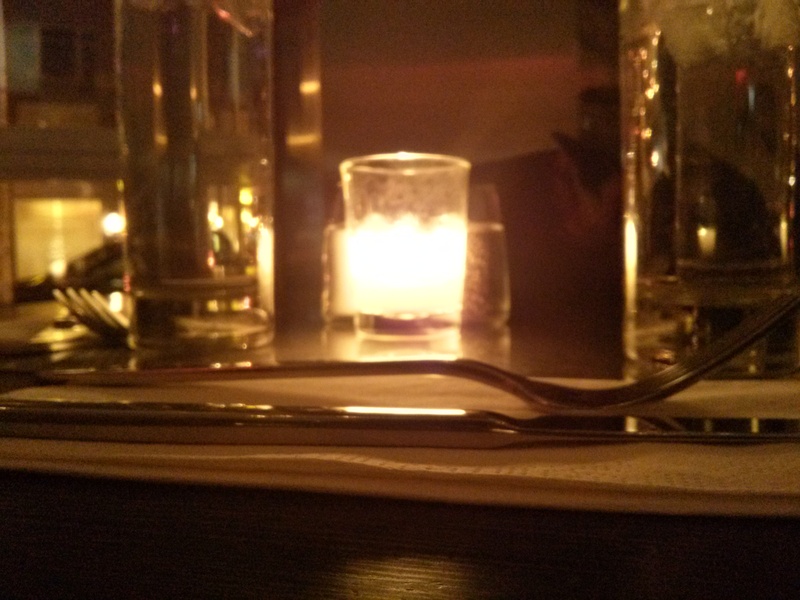 As we wandered around North End, got dinner and eventually, drinks, we got caught up on so much. Before long, they years disappeared. Our time together was too short, both in the late 1980s/early ’90s and on Saturday. Before we left Monday afternoon, there was one more thing I wanted to do on Sunday. I have two friends named Dan who live in the Boston suburbs. The second is my fraternity brother Dan Wood, who probably hasn’t been mentioned in this here blog in a while. I made open-ended plans with him and Renée and I made some plans to do some sightseeing. It was rainy and miserable the last time she was in Boston, so she wanted to do some touristy things she couldn’t do the time before. Then it was rainy, cold and miserable Sunday. We pressed on for a bit, though. 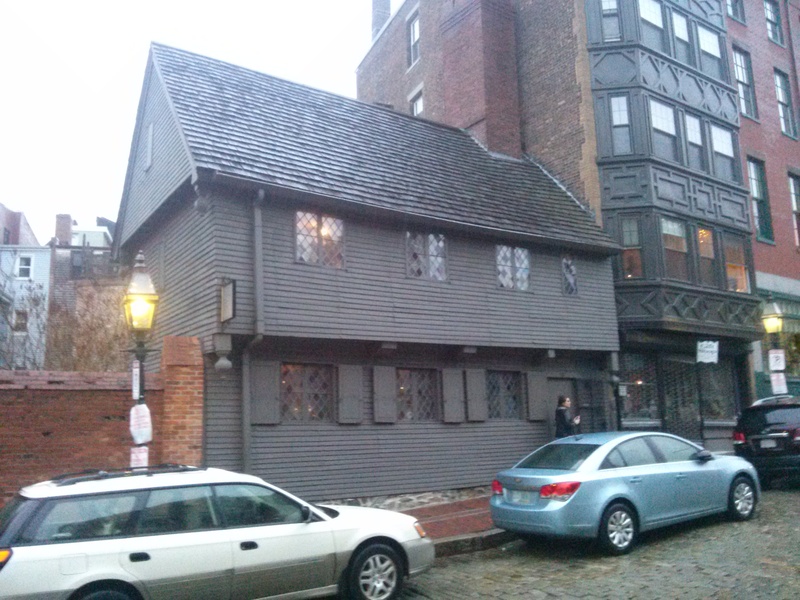 Before Dan Wood met us in an Italian sports bar, Renée and I went to Paul Revere’s house. Initially, Dan was going to meet us at Old North Church: One if by land, two if by sea, three if by T.
Afterward, whilst we were sojourning for Peruvian food, Renée’s booths ceased being waterproof, it started raining sideways and we more or less called it a day. I did want to see Old Ironsides, but I guess I have to be satisfied with reruns of America’s favorite disabled ’70s detective. The skies cleared a bit later on so Renée and I made another quick venture out, but that was effectively the end of our Boston adventure. Monday morning, I scrambled to get us out of the garage to keep it under $50. We made a couple stops, including one in Rhode Island and Providence Plantations so I could say officially that I was in the smallest state with the largest name. I swung out to Harrisburg, Penn., on the way back to take U.S. 15 to U.S. 29, thus bypassing the epicenter of Balt/Wash. That is my way to points north for now on. We got home around 1 a.m. and, less than 10 hours later, I was at my single day of work until Saturday. I celebrated New Year’s at home in not a party situation for the first time since 2000. At least I wasn’t at home by myself. Overall, this was a great trip and Renée is a great road trip partner. Now it’s time to get serious. It’s January 2014. We have less than 180 days before our wedding and there is much to do. This trip was just the beginning of the adventure. This trip started out with a bust. Ever since I had my car, the tire pressure sensor has been off, as in it will come on and off at random at times. If I do have a flat tire, I only know when the tire is actually flat. It went flat a week before my scheduled service. I lucked out on an unseasonably warm day to change my tire. When I had my service done Christmas Eve, I learned that I needed a new serpentine belt. I also learned that I needed a new tire because of where my six-month-old tire was punctured. The dealership is constructing a new building, so my tire wasn’t in stock. We were planning to leave Dec. 26. I ordered a tire online from Sears because it was after 5 p.m. Christmas Eve, I was told it was in stock and could be on my tire early Dec. 26 and I was desperate. It’s not the best tire, but I needed to get out of town. I woke up early Dec. 26, also known as Renée’s birthday, and called Sears to be absolutely certain they could take care of me. I hate getting tires from Sears, but it’s my tire place of last resort. I miss my dealership and tire stores in Hampton and Richmond sometimes. I was told that they did not have my order, despite already taking the money out of my bank account but, if I head on down, they could take care of it. Long story short (as if this is going to be a short story), I had to talk to a call center at the garage, cancel my online order and make a new order in the store because of a “technical problem” on their end. Nearly three hours later, my oil change turned into spending $200 just to be able to get out of Albemarle County. Then I couldn’t get into Maryland. When I plotted out our course, I decided to take U.S. 29 to Interstate 66 to I-495, back to U.S. 29 to I-70 to I-695 and so on and so forth to shunpike New Jersey and avoid the traffic between Washington and Baltimore. I forgot about Tysons Corner. I got stuck in the wrong lane while trying to get on 495, gave up, and cut across Falls Church and Arlington, thence through D.C. to pick up 29 again. Two hours later, I was enraged and on Interstate 70. It was smooth sailing from then on. That is, until I was still in New Jersey at nearly 10 p.m., when I expected to already be at our home for the first two nights of our trip, Stamford, Conn.
We had to adjust our plans to meet one of Renée’s sorority sisters because we were so outrageously behind schedule. We had to go to New York City first, go to Connecticut before midnight to check into the hotel and then go back to New York. At this point, I was sleepy, hungry and a little stabbity. 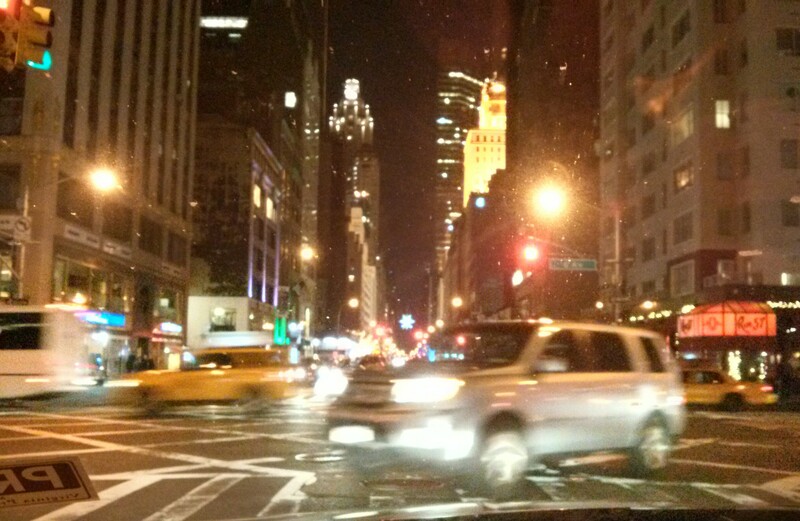 I felt better when I was able to drive around New York. 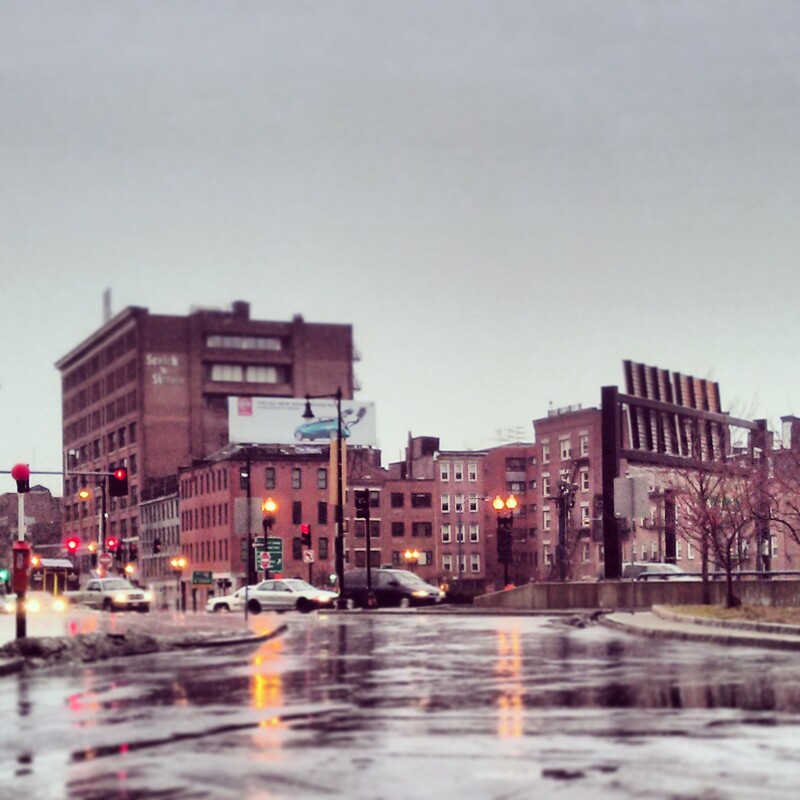 I don’t know why, but driving in that city is one of my favorite things to do. The three of us attempted to get food in Connecticut, but the terrible diner we were in had terrible service and nothing we wanted to eat. We were supposed to have a proper birthday dinner for Renée anyway, so we headed back into the city and to this surprisingly delightful place, Cafeteria. After eating finally, I was running on fumes. We dropped Renée’s sorority sister off (and I finally go to drive on the Grand Boulevard and Concourse) before heading back up to Connecticut. We slept till about 3 p.m. Dec. 27. We were busted. I just got home. I drove about 1300 miles since December 26, and I can scratch three states off my list. I’m way too tired to give a proper update on my trip up north to celebrate Renée’s birthday. Since I can’t go to a proper New Year’s party, this story could very well be our final post of the year.